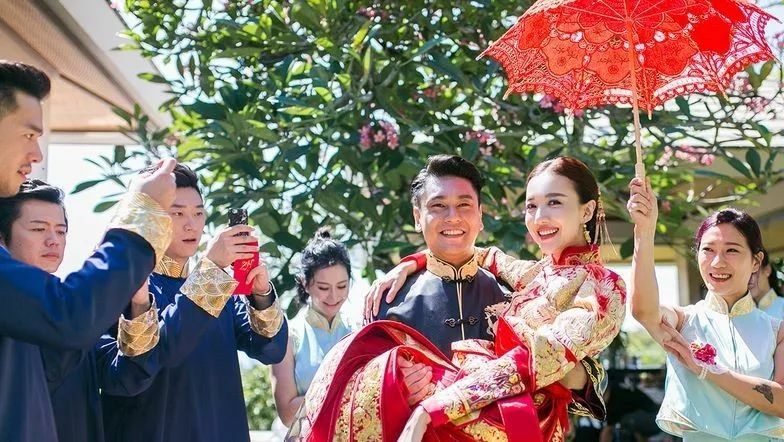 It's been over two weeks and let's be honest, we still haven't gotten over the royal-like wedding of Tang Yan and Luo Jin. Whether in Europe, Bali or China, it's beautiful to see a piece of tradition being preserved through the festive red and orange that many celebrity couples choose to wear - the bride is often in a qipao aka cheongsam dress and the groom wears the male equivalent called the changshan. Chen Xiao and Michelle Chen leave the traditional red for an energetic combination of colors. 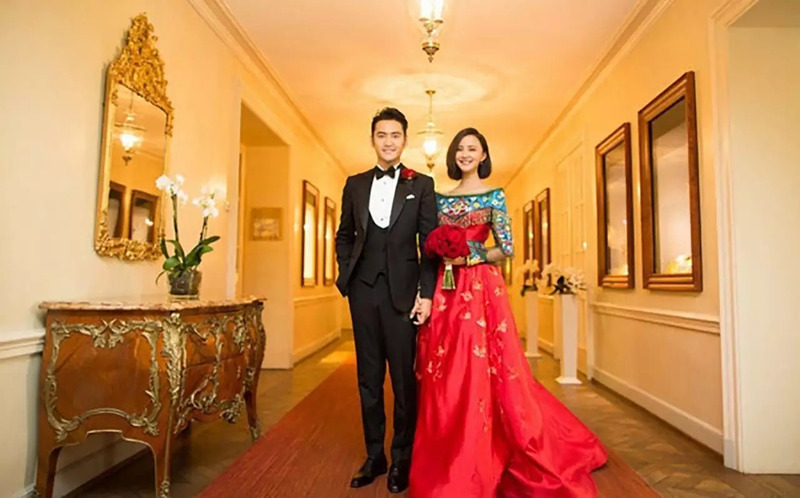 Ady An and her non-celebrity partner Chen Ronglian keep it simple yet elegant. 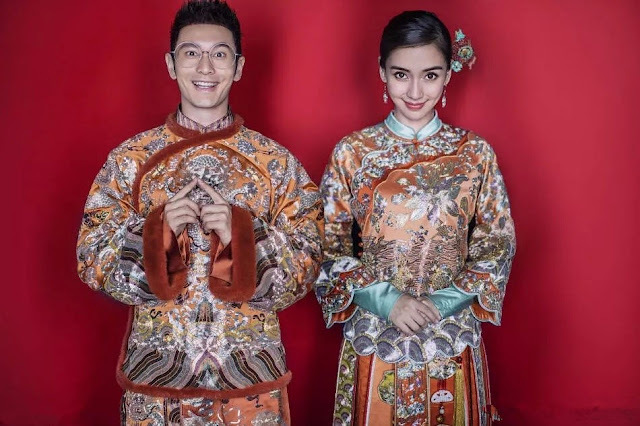 Huang Xiaoming and Angelababy have matching dresses. 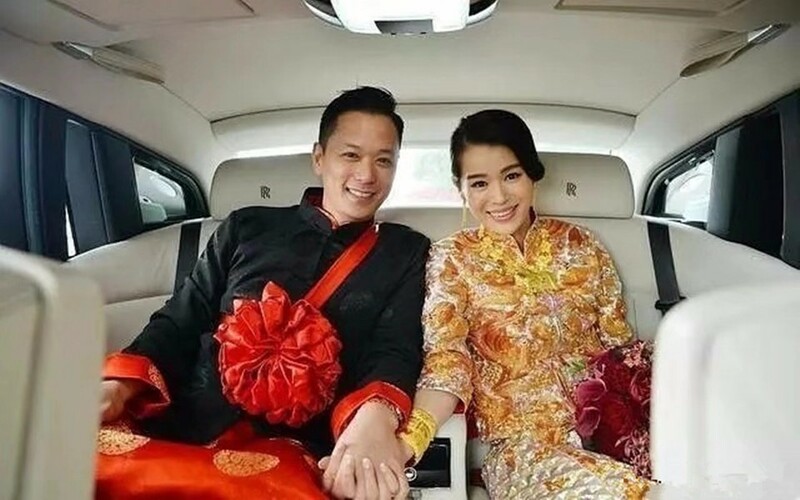 Myolie Wu and her husband Philip Lee go for a black and yellow color scheme. Philip's robes though are quite plain compared to Myolie. Cecilia Liu and Nicky Wu's are probably my favorite, especially the light pink shades of her dress. Ken Chu and Vivian Han under the customary umbrella at their beach wedding in Bali. 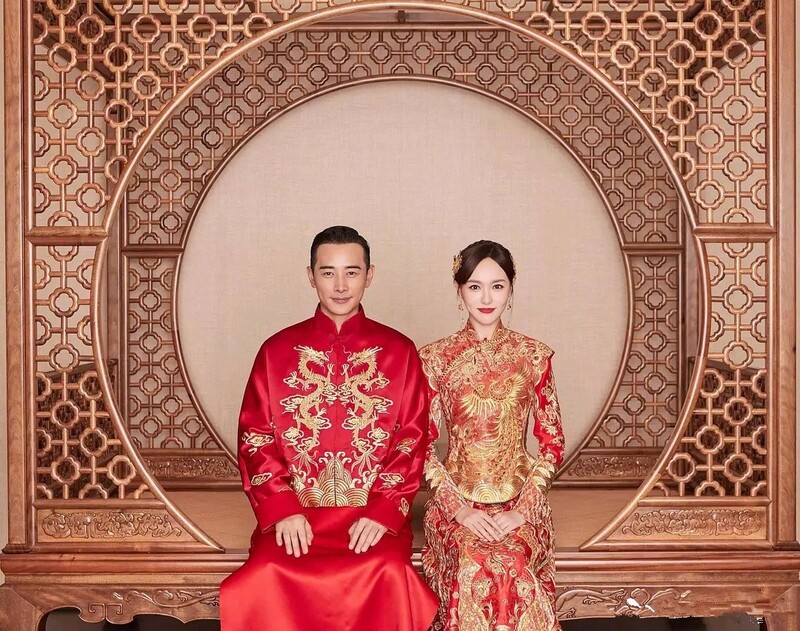 Chen Zihan and Dai Xiangyu are adorable in their bright red attires embroidered with the golden dragon and phoenix. Ruby Lin in an exquisite qipao next to Wallace Huo in his custom-fitted suit. 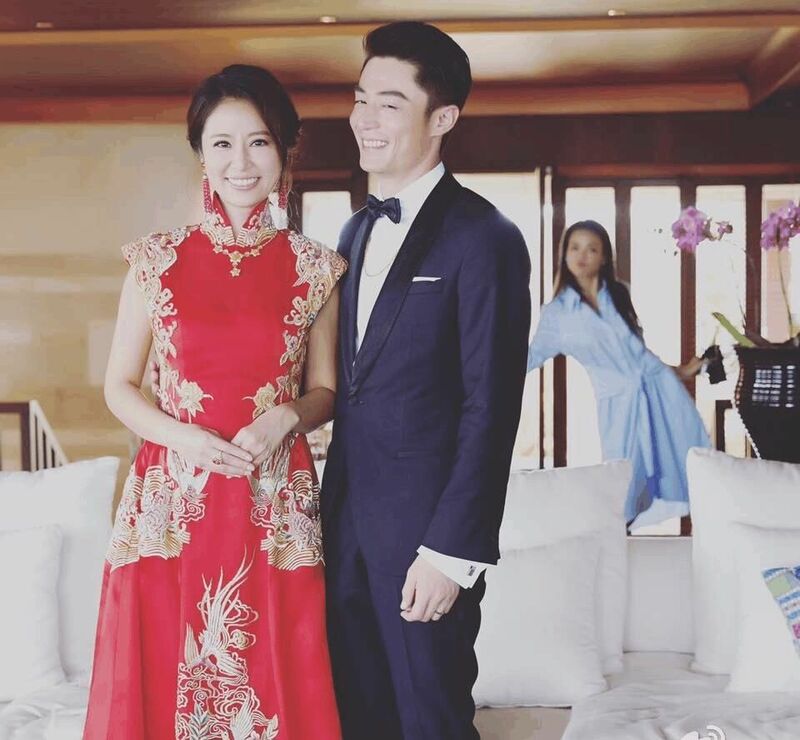 Shu Qi is the stealthy photobomber a few feet away. 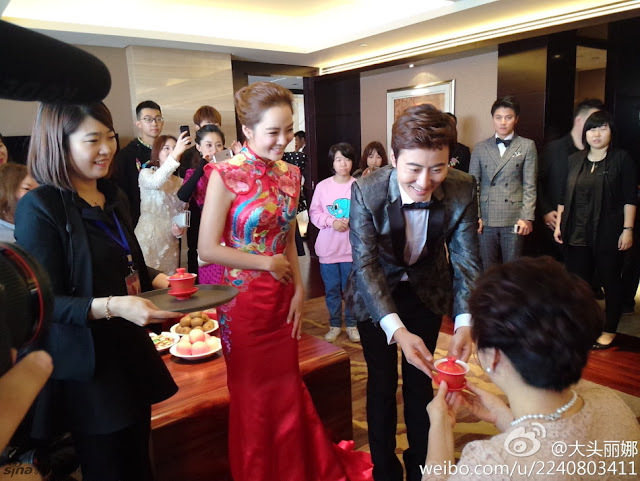 Yuan Hong holds hands with Zhang Xinyi. Her dress gives a chic interpretation that is different from the traditional outfits that we're used to seeing. Vivian Hsu and her businessman husband Sean Lee. A cross border wedding with Korean actress Chae Rim and Chinese actor Gao Ziqi. 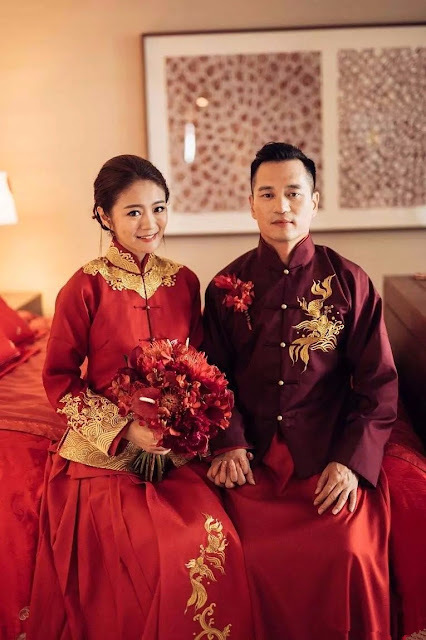 Tong Liya and Chen Sicheng are flamboyantly festive in gold and red. Whose outfit did you like best? Haha LOL I laughed at Tong Liya's, the festival dress it doesn't look like a good dress at all but she is still sooo pretty in it. All the rest are very good to look at. I agree with the best being: Nicky & Liu Shi Shi. I love these traditional outfits and seeing all the different takes. 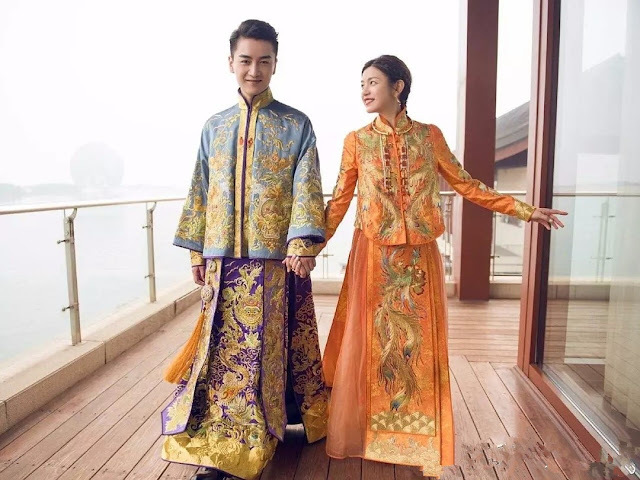 Wish we saw these more in C-weddings than the typical floofy white wedding gowns and black suits. Pretty. Most of the outfits you showed are actually called "Kwa' in Cantonese. This is mostly worn by those from Southern China Canton region more. I am actually surprised to see mainland Chinese stars wear a "kwa". 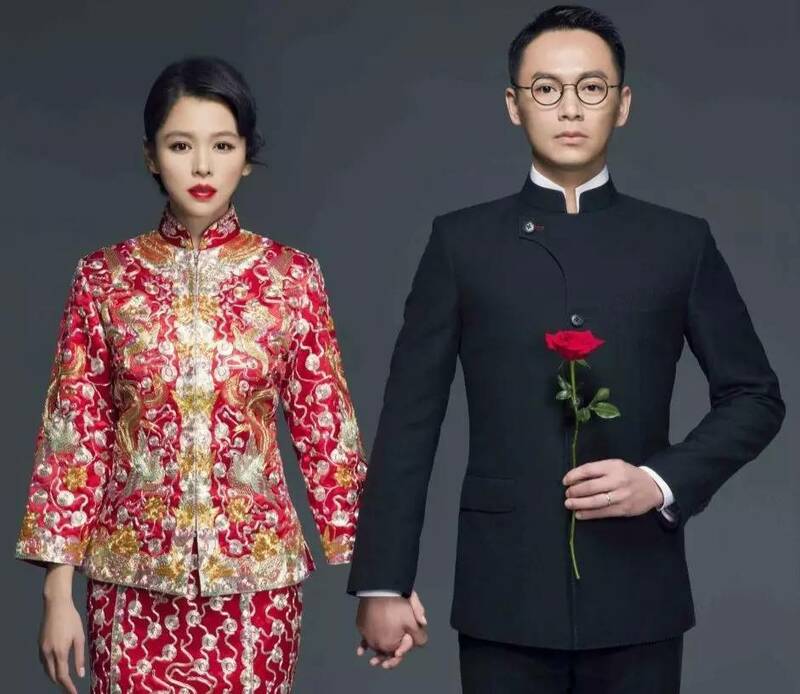 I usually see them were the Cheongsam or Qipao which is the Long fitted dress, that is what Ruby Lin in your article is wearing. Thanks for the collection of stars with their traditional wedding. At least they are not forgoing tradition as I see many of my Chinese friends who grew up in the U.S and Britain are foregoing tradition and is only wearing the red dress. I mean they are only wearing the white wedding gown and not the red Chinese Traditional Dress. I love how they are wearing traditional dresses. I dislike it when people wear white western gowns. They are generic compared to our cultural dresses. We all should cherish our own cultural traditions. 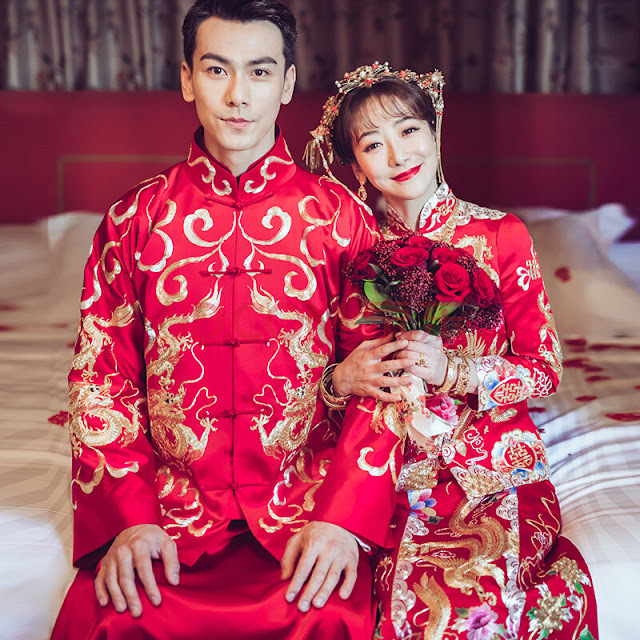 I like Tang Yan and Luo Jin’s attire the best.